Edinburgh Castle (Scotland) is one of a small number of castles which are still in use today. For other uses, see Castle (disambiguation). Castles are medieval buildings which were defensive homes for powerful people. They could be made from wood, stone, or brick, and some were used for hundreds of years. Thousands of castles were built across Europe, the Middle East and Japan with different styles of design. Today, most castles are ruins and many are popular tourist attractions. In places such as England and Wales, castles were introduced by an invading force. They provided a base for troops to control the surrounding area, and over time helped the owner of the castle administer their land. Castles were designed to be imposing: their massive defences put off attackers and showed the owner's strength. A few troops in a castle could defend themselves against a much larger army. The most usual methods of attacking a castle were siege and storm. Each had problems. Storming a castle would kill many of the attackers, but a siege would take a long time. Both methods sometimes failed. The first castles were built in the 9th century and were built up to the 16th century. They combined homes for important people like kings and barons with defences. Castles were designed to keep people out and show how powerful the people inside were. They were sometimes used in war, with many famous sieges like the siege of Kenilworth which lasted for six months. Castles could look very strong, but sometimes the defences were mostly for show. The moat around Bodiam Castle is not very deep and could be drained by an attacking army, so was not very practical as a defence. But it made the castle look very impressive, and look bigger than it really is. If the owner of a castle rebelled against their ruler they might be punished by having their castle demolished, known as slighting. The dining hall in Malbork Castle (Poland). The castle had a large garrison of knights, so needed lots of space for them to eat. A 15th-century drawing of the end of a siege. Troops are storming the weakened castle. 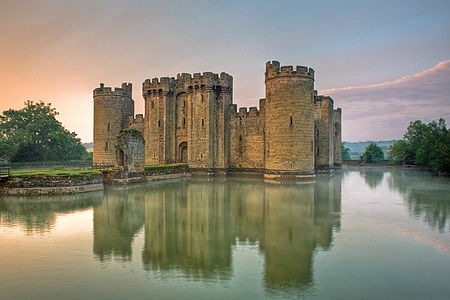 Bodiam Castle (England) was built around 1385. A reconstruction of Holt Castle (Wales), as it was in 1495. Archaeologists, historians, and artists work together on reconstructions like this to imagine how castles looked in the past. Castles were built in Europe and the Middle East, with similar buildings developing separately in Japan in the 15th century. Castles were usually built from either wood or stone, and sometimes brick. Some castles started off as wooden, and were then rebuilt in stone which was more expensive and a stronger so that the castles could be bigger. They could be built on hills or low areas like the edge of towns or at river crossings. When thinking about castles, people often think of ones on high hills. Will there are some castles which make dramatic use of the landscape and are very visible because of this, there were a lot of factors in choosing where to build castles. For example, many castles were built along the Rhine River so they could stop people using the river without permission. Depending on the exact definition, the number of castles varies and more castles are still being discovered. The numbers below are rough, and it is difficult to find guesses for some countries like Italy and Spain though they have many castles. Imitation castles have been built in the 19th and 20th century, like Neuschwanstein or some places in the United States but these are not really castles because they were not meant to be defensive. Some castles like Château de Montségur (France) were built very high up. This made them very visible and difficult to attack. The powerful people who built castles also lived in them with their families. They would have servants and a group of people to make sure the castle worked: people fetching water, cooking, clearing the stables, looking after animals, cooking, lighting fires, and checking who was coming into the castle. In peacetime, most castles only had a few soldiers who would guard the place. Today, most castles have bare stone walls inside but in the Middle Ages they looked very different. Important rooms had colourful tapestries hanging on the walls, and paintings on the ceiling. Other rooms like kitchens or cupboards had plain white walls. Fireplaces kept rooms warm, and candles were used for light at night or in dark rooms. Glass was used later in the Middle Ages, but windows had shutters to keep out the cold and the weather. Religion was an important of the Middle Ages, and castles usually had chapels so that the people who lived there could pray. The King's Bedroom at Dover Castle (England) has been decorated to show how it may have appeared in the 12th century. This fireplace at Beynac Castle (France) is delicately carved. The chapel at Angers Castle (France) where people in the castle could pray. A 14th-century drawing of people eating. Scenes like this would have taken place in castles. Later in the Middle Ages, important people wanted more privacy and larger homes. It was easier to build new homes instead of trying to make the castles bigger, so some people moved out of castles into new homes. The use of gunpowder weapons also changed warfare and made castles less effective. Guns were introduced in the 14th century, and by the 15th and 16th centuries they were powerful enough to break castle walls. New types of fortification were invested, with shorter thicker walls, and using earth to absorb hits from cannonballs. Though cannons were powerful, castles were still used in war. In the 17th century, lots of castles were used in the English Civil War, though many of them had not been lived in for decades and needed repairs. As castles were built hundreds of years ago, most of them are ruins. Some are still lived in by wealthy families, or are still used by governments or armies. Because of this they might have changed and look different to old castles which were abandoned. Many castles have been turned into museums so the public can visit and learn about the past. Some castles are owned by the state, and others are owned by private people. Castles are expensive to run, so many are falling down. Every so often lightning strikes, flooding, or earthquakes damage castles. People have been interested in castle for centuries. Historians and archaeologists have searched old documents and dug into castles to find out more about them. Because of this, for some castles we know who owned them, when they were used, when bits were built, what people ate, and what kind of things happened at castles. But there are lots of places where we know very little, not even when they were built. This is because a lot of medieval documents do not survive. Some castle ruins have been rebuilt to look like they did originally. Castel Nuovo in Naples (Italy) was built in the 15th century and is now a museum. Šášovské castle (Slovakia) was built in the 13th century and is now a ruin. Prague Castle is used by the President of the Czech Republic. Diósgyőr Castle (Hungary) was rebuilt in the 2010s. ↑ 2.0 2.1 2.2 2.3 2.4 2.5 2.6 2.7 2.8 "EBIDAT - Burgendatenbank des Europaischen Burgeninstitutes" (in German). Retrieved 4 July 2018. ↑ 3.0 3.1 "Statistical information". Gatehouse Gazetteer. 25 March 2015. Retrieved 4 July 2018. ↑ "Castles of thousands". 14 December 2017. Retrieved 4 July 2018. ↑ The image is from the Luttrell Psalter which was made in the 14th century. The Simple English Wiktionary has a definition for: castle. "Top 100 of medieval castles". topcastles.com. Retrieved 7 August 2010. This page was last changed on 29 March 2019, at 01:36.